It’s birthday time again and this year my niece requested a Rapunzel cake as she absolutely loves the new Disney Movie Tangled , featuring Rapunzel and her long magical hair. Since we created a pink Princess Castle Birthday Cake last year, we decided to skip the tower and create a Rapunzel doll cake. I love how this cake is also a birthday present. After the cake is enjoyed by all, the birthday girl can still play with her new Rapunzel doll! It was interesting to see how many different Disney’s Tangled Rapunzel Dolls are available for purchase. The doll we used in this cake was purchased at Walmart, but we also found a different one at the Disney Store (we preferred the look of the doll from Walmart and they were roughly the same price). 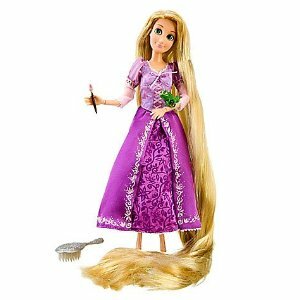 Even easier, you can also find a variety of Rapunzel Dolls available online . To decorate Rapunzel’s dress, we used Wilton Violet Icing Color . It would have been faster to keep the dress on the doll and not decorate the top of the dress (we could have wrapped the bottom of the dress in a clear plastic bag or plastic wrap before placing the doll in the cake). We decided to remove the dress and decorate the entire dress with purple icing. 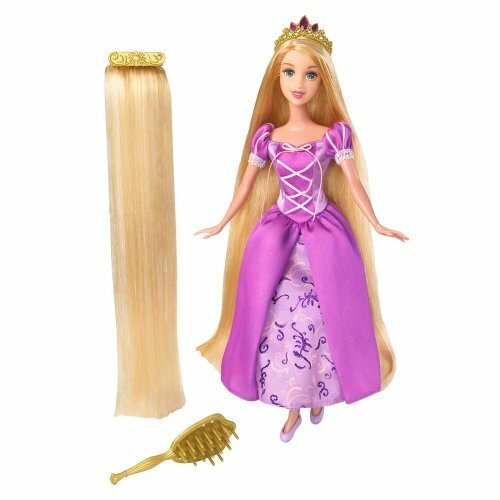 This approach didn’t require perfect purple color matching to the existing dress and we didn’t risk the Rapunzel doll’s satiny dress getting spots of icing on it that may have stained or been difficult to clean. We also chose to braid Rapunzel's hair, so strands of hair didn't get stuck in the purple icing. Don’t forget to check out all the fun Rapunzel Birthday Party Supplies . There are so many available, we used matching Rapunzel cake plates and napkins. Wow that cake looks great.